There is mounting research evidence that contests the metaphysical perspective of knowing as mental process detached from the physical world. Yet education, especially in its teaching and learning practices, continues to treat knowledge as something that is necessarily and solely expressed in ideal verbal form. [Emphasis mine.] This study is part of a funded project that investigates the role of the body in knowing and learning mathematics. Based on a 3-week (15 1-h lessons) video study of 1-s grade mathematics classroom (N = 24), we identify 4 claims: (a) gestures support children’s thinking and knowing, (b) gestures co-emerge with peers’ gestures in interactive situations, (c) gestures cope with the abstractness of concepts, and (d) children’s bodies exhibit geometrical knowledge. We conclude that children think and learn through their bodies. [Emphasis mine.] Our study suggests to educators that conventional images of knowledge as being static and abstract in nature need to be rethought so that it not only takes into account verbal and written languages and text but also recognizes the necessary ways in which children’s knowledge is embodied in and expressed through their bodies. Reading this abstract I am reminded that when I was in college I was concerned with, among other things, the continuation of a dichotomous world view; you know, seeing only us/them, self/other, intellect/emotion, good/evil and not any of the gray area in between. In particular, one of my main concerns at the time was of the mind/body split. That's where my former self comes in; it turns out she actually has a lot to offer this discussion. Here is an excerpt from the introduction of a paper I wrote at the end of a quarter of self-directed study in 1989. The paper is grandly titled "Connections: Healing the Split within Western Thought" and although I'm pretty sure it wasn't my best work, I find this portion to be particularly interesting. "In a dream I had a couple years ago, I cut off my head and walked around with it under my arm. But the funny thing was, I could still hear and think, and feel. I sat it down on a bed and we looked at each other for a while. Then it was time for me to put the head back on my neck; I tried to keep it there but it flopped around like a little baby's head. Finally, I got it settled, but then realized that I had to sew it to my neck -- but I hate to sew! So I just let it sit there and walked around with a bright red line of blood around my neck. I never did connect my head to my body, until now." "In the following pages, I touch on the issue of how we have become so disconnected with the world. And, more importantly, I look at the steps we can take to heal the split to become whole again. In Part One, I trace briefly the major steps in history that have contributed to the dichotomy of thought that exists in our society today. In Part Two, I present the foundation of holistic thought, which includes a brief discussion of Gregory Bateson's epistomology -- how we can learn to know the world as it really is. Part Three investigates the characteristics of creativity and how it can help everyone reach her or his potential in life. And, finally, Part Four shows how, when combined, Systems Theory, Batesonian epistemology, and creativity create an understanding of how we can, at least in theory, heal the split." Um. Okay, I know that was a big bite of thinking I took back then but let's but fast forward to now. I suppose you could say that in creating a curriculum that integrates math and dance, using concrete movements and patterns executed by the body to illustrate and illuminate the often abstract world of mathematics, I am attempting to 'heal the split.' I should also say that, at the time, I was acutely aware that I was short on life experience with which to illustrate my ideas. My twenties were spent searching for a solid tether; when I found step dancing five years after this paper was written I felt a huge relief that I was finally doing something meaningful and real. And now? Now it seems I've come full circle because from where I sit it is clear to me that finding the connection between mind and body has been my life's work all along. I also like reading about the seeds of my interests in understanding the uses and benefits of creativity outside the realm of artistic process. But that's for another day. Another 'map is not the territory' moment...﻿﻿﻿﻿ This one hangs in my home studio/office to keep me in line. Does it relate to your life in any way? "But there are bridges between the one sort of thought and the other, and it seems to me that the artists and poets are specifically concerned with these bridges. It's not that art is the expression of the unconscious but rather that it is concerned with the relation between the levels of mental process...Artistic skill is the combining of many levels of the mind -- unconscious, conscious and external -- to make a statement of their combination. It's not a matter of expressing a single level." You may remember that back in November I had an article accepted for publication in the Teaching Artist Journal (TAJ); the TAJ is a research initiative of the Office of Academic Research, Columbia College Chicago. Shortly after the article was finalized I was asked to become an Associate Editor of the TAJ. This is a huge compliment, and a great honor to be included in what is currently the only peer reviewed journal dedicated specifically to the work and thought of teaching artists. I've subscribed to the TAJ since it's inception, but that was seven years ago now, and in 2003 I had just started thinking about how math and dance (percussive dance in particular) could be brought together. So, before I receive my first article to shepherd through the peer review process, I thought I had better go back and take a look around past issues and get (re)acquainted with the work that has been done prior to this moment. What is interesting to me is how much my experience has changed me in the last seven years or so. As I go through the first four volumes of the TAJ I realize am looking at these articles with new eyes. There is so much there that could have been really helpful to me at the time, but I didn't really see it. Why? Because I was still new at being a teaching artist. Because I was in the middle of my own process, slogging away, trying to figure out what a math and dance integration would look like or even if it was a workable idea. In short, I had to have my own experiences. I needed more time doing the work of being a teaching artist before reflecting on my place in this profession or even really being able to fully understand what other teaching artists were saying about their own work. 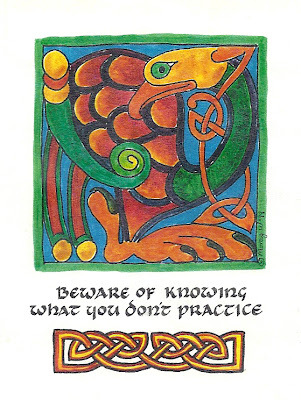 That, in a nutshell, describes my view of how the learning process should be. Actions first, reflection later. Concrete to symbolic. In Math in Your Feet we quite literally jump into dancing from the first moments of the residency. As children build their understanding of and competency with percussive dance elements, they are able to apply this new understanding towards making connections between math and dance. By the end of our time together they are usually able to understand their own personal relationship to the world of both dance and math because now they, too, have become creative problem solvers in two great fields of inquiry. Most kids who complete a Math in Your Feet residency report being proud of their efforts as well as how much more they understand about both math and dance. Sort of like how I'm feeling right now. But this is no time to rest on my laurels -- I have seven more years of the TAJ to look through! I estimate that at the rate of one article a night before bed I may be through them all by some time in early May. Better get to work! I am always on the lookout for connections and commonalities between mathematics and the arts, dance in particular. In my on-going survey of math/movement/dance approaches out there, most of what I've found seems focused on numeracy and procedural concerns; these are not necessarily wasted efforts, but why stop there? There is also a lot of illustration of math concepts using dance, but the two subjects stay on parallel tracks with no real connections between the two. Overall, approaches like these never get to the deeper commonalities between math and dance because they are often more focused on memorization or performance of prescribed movements than understanding and application. The main focus of Math in Your Feet is a thorough exploration of patterns. Since my dance form is based in making foot-based dance patterns, it is a natural and meaningful connection, especially if the goal is to develop mathematical thinking and not simply working to improve skills or memorization of procedures or formulas. After patterns, another commonality between math and dance is certain habits of mind and flexibility of spirit in the process of finding solutions. With that in mind, I submit to you two diagrams, one from a math point of view, the other from an arts perspective. 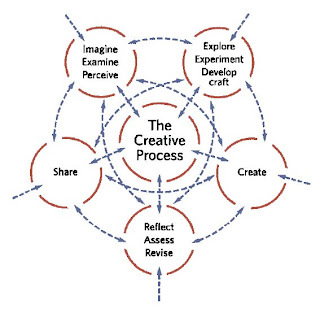 Coming from the other perspective, when I look at the next diagram, from the article Defining Arts Integration, I think about how mathematicians go about posing and solving problems and definitely see connections to this arts-based diagram of the creative process. 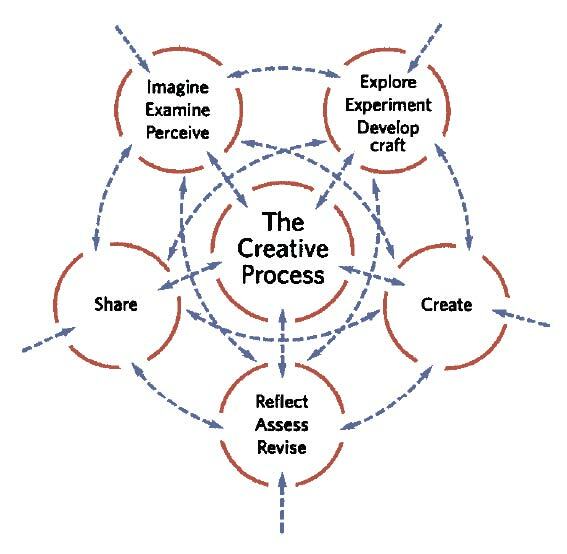 The creative process is a hallmark of artistic activity and, I'll argue, a hallmark of mathematical thinking as well, just not labeled as such. "Motion Math creates movement-based learning games that give players an intuitive sense of math." "Motion Math: Move, Play, Learn!" Ummm...this is a hand-held game that involves tilting an iPhone. If you go to the site and watch the promotional video, you see kids sitting on couches, staring at little screens. So what if they might get better at fractions? They most likely already get enough screen time. And yet, there they are in the video, sitting on the couch, watching a little ball bounce on the screen while their precious brains are wasting away into cyberspace, or wherever brains go when their bodies aren't moving. I just finished a big week with four classes of fourth graders. Their teachers told me they were a tough group on the whole, but of course it's only through experience that I figured out what that meant, exactly. I've had tough groups before, but these kids confounded me, actually. There were bright spots in each class, and there was also some good thinking and creating, when it happened. But, on the whole, they could barely stay in their squares. They would forget any verbal instructions I gave. I had to stay within two feet proximity to get any attention at all. Most of them could not consistently find the center of their dance spaces. They took every gentle reminder as a power struggle. Transitions such as moving from sitting to standing or dancing to not dancing with control was a herculean effort for them. Don't get me wrong. These were not 'bad' kids, just kids with a lot of challenges. I've spent a lot of time over the years figuring out how to help kids control their bodies while moving and then again when the moving is done. I've also spent many years helping kids become more aware of where they are in space and where in space they are intending to go, with good results. But this particular week, none of my strategies seemed to work. 30 minute class length, or less. I am contracted to implement my program within certain parameters including the amount of time each class has with me (usually 60 minutes at a time). Classroom teachers who implement Math in Your Feet in their own classrooms have the flexibility to work on it in ten minute chunks or whatever length they choose. My 4th graders this week had to hold it together for a whole hour with me each day, which was a loosing proposition. Take it out of the gym and find a more enclosed space. The gym for this particular week was not a bad gym in terms of sound issues, but it was a gym none-the-less. I never use the whole gym and always define the limits of our dance space (with tape! ), but if we could have put walls around us to enclose the space somehow, it might have helped the kids feel safer and may have helped the focus issues. Reduce transitions. It's a hard reality, but we have to get up and move, and then we have to sit down and listen. We do both in short bursts, which these kids needed, so I'm not sure exactly how I would have done this. Dance for them more to keep them focused on the reason for why we were together. Teach one two-person team at a time. The only times they were really quiet, focused and, well, not argumentative and actually helpful, was when a team was up in front of the class showing work in progress or demonstrating a math concept through their dancing. If I could do this over I'd take the plunge and just teach one team at a time while the others watched. I think we would have gotten a lot more acomplished this way. Acknowledge the issue of 'first reaction' sooner and with all the classes. I think I got this idea from a parenting book I read in the the last year. Essentially, each one of us reacts in our own way to new situations. We have either a negative first reaction or a positive first reaction. Knowing how we operate in this regard can help us overcome the challenges each present. For those with a negative first reaction (hold back, regard with suspicion, decline to participate, or exhibit unhelpful behavior) it just means making sure that they know that I understand they're not into it at the moment and that's okay with me. At that point I usually outline what my minimum expectations are for participation-- stand when the rest of the class is standing and sit when the rest of the class is sitting, and that's it. I've had success in the past acknowledging the reality that kids may not love what we're doing as much as me, but I still expect them to give it a shot. By the time I realized what I was working with, it was too late in the week for this strategy to have much effect. That usually gets us over the hump, but not this week. So, all in all, we did get through the week. I suppose the bright side of all this is that I'm a little more ready the next time I encounter a group like this. And, I'm still a big supporter of using dance and movement in integrated ways for all children. Just because it didn't work for them the way I wanted this time doesn't mean that it can't. It just needed to be different. Too bad my time machine's in the shop, or I'd try again. "Ten years from now I will remember how hard it was to learn and how much fun it was. The challenges I had were putting pattern A and pattern B together. The thing that helped me work through them were because I had D. as my partner and he was always hard working and an on task friendly boy. :) I loved this program." Hey, check this out! My workshop at the NCTM 2011 Annual Meeting and Exposition is featured in their promotion of hands-on workshops at the conference this coming April. I see a few there I'd like to attend myself. Maybe next year I can do one on tape as the ultimate math manipulative? Big talk, I know, but I'm on a mission to prove my theory. Hey y'all! Look what I found this morning -- a beautiful and thoughtful blog from a dance specialist in the Seattle Public Schools. I really wanted to share because this is the real deal. I don't know for sure, but I think many of my readers are curious about how dance and/or movement fit together with math, and maybe other subjects as well. There's a lot to sort through out there in web-world, so I was excited to find this. Here's a great link from her blog with a list of resources for integrating dance with curriculum. You might also like the big picture of her work here. I'm curious what you think about this Math & Movement program. I found it online and it looks interesting and helpful on a couple levels. Right now, my only clear thought is that it's probably an effective way to get kids moving in classrooms where they normally wouldn't be by helping their teachers become comfortable with using movement as a learning tool. But, I'm not sure about the program's singular math focus on numaracy (numbers, counting, multiplication, etc.) There is more than counting in math, and more than counting in movement, too. I have other thoughts, but I'm curious about yours. Even if no one comments on this post, I'll have a follow up discussion with myself, but it'll be more interesting to hear what you think!